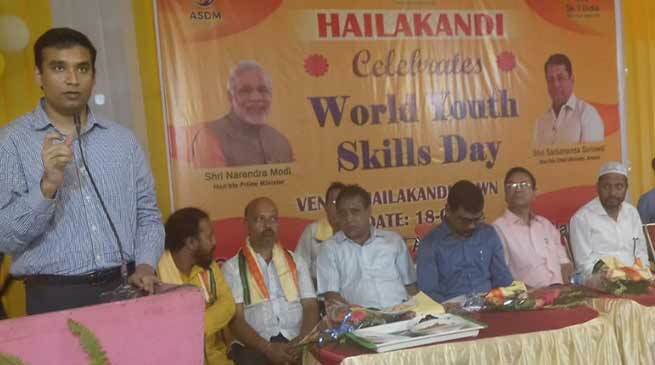 The Hailakandi district administration of Assam celebrated the World Youth Skills Day on Wednesday. Inaugurating the daty-long programme at the Town Hall in Hailakandi town, Deputy Commissioner Adil Khan exhorted the youths to hone their skills to meet the ever-growing demand for technical and vocational jobs. Speaking on the occasion, District Development Commissioner, FR Laskar urged the youths to upgrade their skills to become successful entrepreneurs. Sponsored by the Assam Skills Development Mission under the Aspirational Districts, the discussions by resource persons and experts focused on innovation and emerging technologies as well as what skills youth need to operate in future economies to become drivers of a sustainable future. Training was imparted to the selected youths on computer data entry, computer hardware, tailoring, retail sales, mobile repairing, etc. Resource persons, officials from Assam Skills Development Mission, education department, banks and industries took part in it. On July 15 every year, the United Nations celebrates the World Youth Skills Day globally to create awareness on the importance of investing in youth skills development. The international community has established an ambitious 2030 Agenda for Sustainable Development with education and training as key determinants of achieving the agenda.